Believe it or not, I coach my wife. If I can coach my wife, you can coach the people on your team. She knows if I’m coaching by my emotional state. Energetic emotion gets in the way. Calm questioning helps. When I’m emotionally calm, it frees her to explore her own ideas. Hot emotion indicates I’m trying to fix her. My coach, Bob Hancox, author of “Coaching for Engagement,” gave me a useful suggestion during our last conversation. He observed that I come up with a couple options and then ask a great open ended question. His suggestion? Start with the open ended question. The message I made from his suggestion? Stop trying to be so helpful. History that includes failure and frustration. They don’t get to choose outcomes. The problem of ulterior motives. 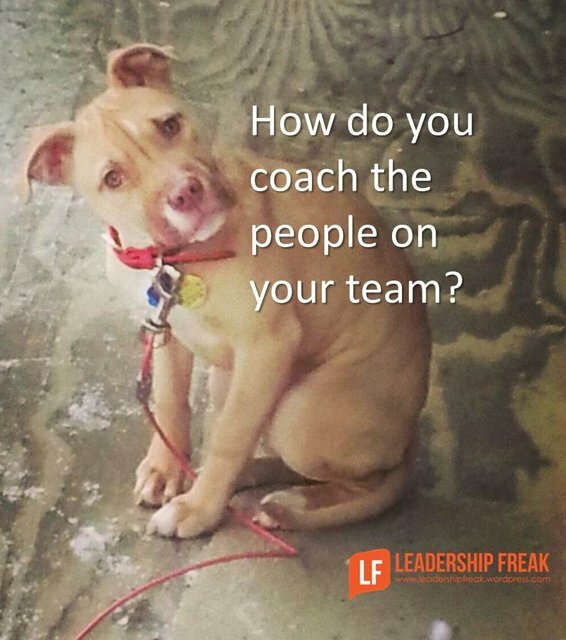 They wonder if you’re really coaching them or just asking leading questions. Are you manipulative? Acknowledge the special issues of being a coaching-leader. You’re still the boss. It’s easier to be coached by someone outside your organization. Work on trust, transparency, candor, kindness, optimism, and flexibility. Establish a structure for coaching conversations. Agree on the issue and the desired solution up front. Then start the coaching part of your conversation. Stop bringing up past performance. Coaching is a forward-looking activity. Be affirming but agree on accountability. Try thirty minute meetings. You’re time pressured. See if shorter meetings work. Set the next meeting at the end of your current meeting. Establish rhythm. What are the challenges of being the boss and the coach? How can leaders and managers coach their employees? The title really caught me and I was ready to read some juicy details. But then as I read it I realized I had been tricked. Now I’m just left with some quality steps and guidance on how to meaningful impact another like you know I can’t resist. Ah, ha! The title played with my head too… 🙂 My wife’s a very gifted person, I spend most of my time trying to keep up not coach! I find that bringing up the past is like opening the garbage. It’s distraction that’s filled with negative emotion. Focus on the situation not the person. Bingo! Great point…make the situation the focus. I’m not into sports so those metaphors don’t typically resonate with me, but this works. A sports coach is focused on the organizational goal; the win. The players need coaching to most effectively at their role in meeting the org goal. If people can take advice, be comfortable with communication, be open to seeing thing from other viewpoints, it is easy to be coached by a superior without feeling manipulated or bossed. So therein is the rub for leaders: making everyone feel comfortable with that level of communication. I find that if I offer a disclaimer that proclaims my objectivity and desire to help, not to force, it has more impact and is better received……but I know this strategy could use improvement. Actually, the title did intrigue but there was excellent advice on how to coach appropriately. I too liked the advice of not bringing up the past. I don’t think I’ve been very good at sticking to that rule. I’ll be more conscious of it now. Oh, and I agree – great title! Thanks Sarah. Best wishes as you move forward. You got me thinking about the freedom that comes from letting go of a past that holds us back. Great title and sound advice about coaching people you are close. To coach or teach that is the real dilemma, often times people don’t want help, or they would ask for it, then again others don’t want to ask for help they feel demoted, afraid to look bad. I think the key for the leader is to determine when to coach and when to instruct. The past is what it is leave it be as you suggest, but the past may reflect the individuals have stayed their course or need to be re oriented to focus on the assignment, tasks, job etc. Dan has a funny bone. Yet, what a theme to start meeting: “Coaching My Wife!” That oughta get rapt attention–and lots of staff to a meeting on time…perhaps early. And more than that, a “leadership therapy” case might even be made. Men and women, like husband and wife (and leaders and staff members), are not mind readers: We have to ask for what we want. Let’s be clear: Subtle hints do not work! Strong hints do not work! Obvious hints do not work! Just say it! Anything we said 6 months ago is inadmissible in an argument. In fact, all comments become null and void after 7 Days. If something we said can be interpreted two ways and one of the ways makes each other sad or angry, we meant the other one. We can either ask each other to do something, or tell each other how we want it done…not both. If we already know best how to do it, let’s just do it ourselves. If we ask a question we don’t want an answer to, let’s expect an answer we don’t want to hear. Or some semblance of that. Thanks David. Good question. It feels open and nonjudgmental. In the same vein, I learned in my days as an auditor the power of the phrase “what am I missing?” It allows me to challenge the thinking but conveys a humble tone that maybe I am not looking at the situation correctly or with all the necessary information. I am allowing that they might be correct and giving them an opportunity to explain where I am wrong. It is a subtle difference but people would much rather explain why they are correct than why they are not wrong. Thanks Ed. Another great question that opens doors. Glad you dropped in today. I am going to borrow that which is much better than the aggressive “would you like to explain…” that i have heard. Don’t let the past be an indication of the future! Dan, I opened this immediately I saw the title and I was ready to dive in . . . but I was not disappointed 🙂 I get in trouble once my coaching side tries to get in the discussion. I love your advise that we should “Stop bringing up past performance. Coaching is a forward-looking activity.” Thanks for another sound advice. Can you coach someone who doesn’t want to be coached, doesn’t want to grow or get better at what they do? I know the obvious answer, but is this situation ever worth pursuing (ie try to gain trust, etc) or not? Michelle, I don’t think you should try to coach someone who doesn’t want to be coached (if they understand what is involved). She or he is clearly not seeing you voluntarily. By “coaching” against that person’s will the coach is colluding with coercion. I wonder if this can ever be ethical? in my experience is it worth the effort! I’ve seen this situation where it is all about trust. The person being coached mistrusts your motives: they see that you are trying to build them up, only so you can load them and work them harder. You have to make them believe you aren’t just training them like a draft horse, so they can pull harder. I agree with all the comments on the post. But the one that stood out to me the most was that in order to be an effective coach, one must have developed trust and transparency. Without trust, coaching cannot be effective. This post also reminded me how important it is to develop our listening skills – effective coaches lead their team to discover solutions rather than dictating or suggesting what needs to be accomplished. Great post and excellent reminders! Good stuff, though I don’t think you can often “Agree the solution up front”. That seems the opposite of helping people to come up with their own solutions, which is coaching at it’s best. It certainly would not work with my wife! She just wants to be listened to and understood. Great post Dan and just reward to see such infectious enthusiasm based on the potential of annoying our partners. I have really enjoyed this thread and particularly the notions of asking permission before starting to coach someone and the unique role a leader/manager plays as coach as they are typically invested in the outcome in a way that a professional coach is not. One of the fundamentals of coaching is curiosity which I believe is comprised of really listening to the person, focusing on the speaker without judgment and asking open questions that are in no way leading. When coaching does not seem to fit in a particular situation (think person does not want to be coached, time constraint), being curious can help leaders/managers to truly see, hear and understand others. By asking just a couple of open questions one can begin to appreciate the perspective of another which can lead to collaboration, innovation and greater understanding. Another interesting point is that neuroscience supports the notion that curiosity makes us feel good. Judith Glaser (Conversational Intelligence) describes how dopamine is released when we are curious which leads to the creation of curiosity in our brain. As we continue to be curious, we develop a heart-brain connection, opening us up so we can connect with others. This increases the release of dopamine and the release of oxytocin, both of which help us to ‘feel good’ and develop deeper connections. The calming questions Dan refers to can diminish the emotions and help us stay calm, even in challenging conversations. If we can stay curious, we can navigate challenging conversations instead of avoiding the elephant in the room. A good read Dan but what happens when the TRUST that is implicit to good relationships, especially between a husband and wife, is part of the challenge to coaching. Or frustration or an ability or inability on the part of the employee to want to be coached. Sometimes hard to get past the challenges!! Not sure which I like MORE – the picture of the puppy or the advice that this post offers! Ok. The post wins. It is full of valuable tools and reference points. The picture of the puppy is just sooo adorable, though!? Have a wonderful weekend! Your efforts on this blog are appreciated on so many levels. Thank you. My wife’s immediate reaction to being coached is to become defensive, because if you need coaching, it obviously means you are defective. She isn’t the only one, but it illustrates the point: people don’t necessarily want to be coached because they don’t want to have flaws pointed out. Also, you can try as you like to put a bar on the past, but you can’t get people to “un-remember”. It might be six months, or six years ago, and discussion is”off the table”, but it colours peoples’ perceptions and responses. Yes, it’s challenging to try coach between man and woman. Usually I find myself in a situation where I am defending myself about not having a particular opinion that the asked question(s) represent. I JUST asked.